A newspaper article from the Bradford Witness, written by Mrs. J. A. S. Mills of Dunkerron in November 1965. The article provides the history of the Bradford West Gwillimbury area at-a-glance and includes information on Governor John Graves Simcoe. 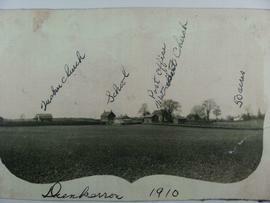 Profile view of Dunkerron in 1910 showing (l-r) Quaker Church, School, Post Office, Methodist Church, Walker House.